Does anyone know of any place that might sell a purse similar to this one? I bought several of these a few years ago via House and Hobby, but sadly the zips keep breaking on them and I'm running out of spares. 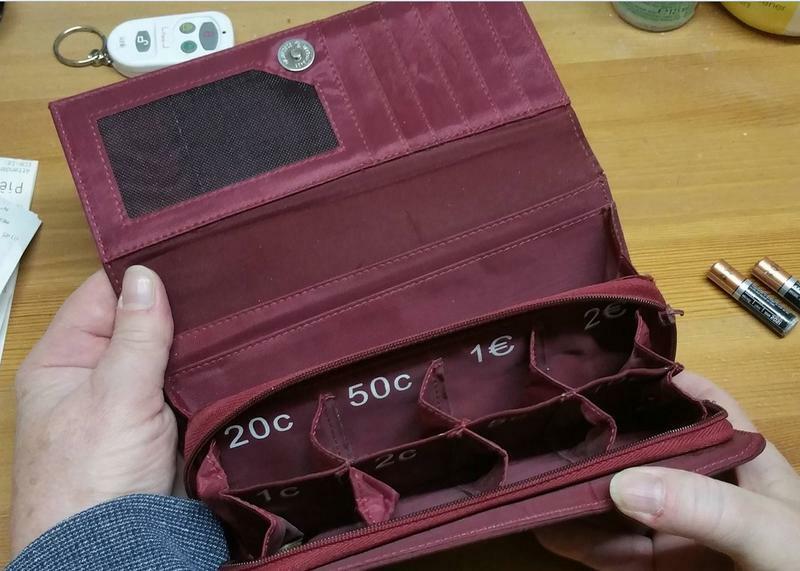 I really like having the separate compartments for the coins, but haven't managed to find anything close to this design in the shops so far. If you know the brand, you could contact the manufacturer? Not looked in the shops but if you search for ‘porte monnaie / trieur de pièces’ there are a few options on amazon fr. Oooh. I assume the remote and the batteries are for the purse. You you scan the till display and the right amount of change pops out? When I was a kid I wanted one of those things that bus conductors* had; a sort of metal doodad with spring loaded slots full of coins. The remote is for the burglar alarm which has the habit of going off whenever it feels like, even though it's not actually set. Hubby says it happens when the batteries get low - it thinks it's being tampered with and goes off. Unfortunately it's somewhat LOUD and I have to run for the control asap to shut it off before I'm permanently deafened. Did it to me 3 times last week so I took to carrying the remote around with me. It's nearly always me it blasts because it rarely goes off when hubby's home of course. Bloody thing. I'm just waiting for the point when it goes off in the wee small hours of the morning. Guess who's going to get kicked out of bed to deal with it then. Last edited by Medea Fleecestealer; 04.03.2019 at 16:37. Now that's segregation if I ever seen it! And segregation with a broken zipper. Wouldn't surprise that some lobby has forced the EU to put a ban on it. Swears loudly. Neither France or Germany will deliver these to Switzerland. Why the F word not? Think a lot of places are a bit wary of shipping to Switzerland since the beginning of the year in case they need to bugger about with MwSt at their end. You can get it shipped to somewhere like Las Burg in Lörrach near Basel. I guess Konstanz will have something similar, if that's nearer. I found a couple of the brand LoLuna on the .fr site which will ship to Switzerland that’s why I posted that as an option. I got all the way to the checkout where it asked for the credit card details but didn’t proceed any further. Got any friends in Germany? And an other one ... oooops sorry, minimum 50 pieces ..... how long does one last you? But they probably have models closer to what you want. Yeah, saw that on the various Amazon sites as well. Might be one to go for since it's Swiss based. Thanks curley. Does this purse work with Swiss franks too ?